For several years in the late 1990s, I had an office in the old Army Museum building at the Presidio of San Francisco. Decorating my lawn were cannon of various ages, sizes, and artistic merit, dating from the 1600s to World War II. The one that drew the most attention, especially from school children, was an ornate, ten-foot long bronze cannon captured in 1898 by the U.S. Army in Cuba and engraved with the name “Prince de Conde,” a nod to its French origins. The cannon had arrived in San Francisco in 1899 as a war prize and subsequently underwent a tortuous trail of exhibit locations before ending up on the Presidio lawn in 1973. I’ve been able to document its meanderings with the help of the photo collections of OpenSFHistory.org and a few newspaper search engines. Somehow, the cannon came under Spanish ownership and made its way to Cuba where it was emplaced in the defenses of Santiago. There, during the Spanish-American War, it was captured by U.S. Army soldiers commanded by General William “Pecos Bill” Shafter. Numerous other cannon were captured along with the Prince De Conde, and a dozen of the finest bronzes were shipped back to the U.S. as war prizes for public display. Because General Shafter was from California, the government allowed him to select two cannons for his home state. He chose Los Angeles and San Francisco as their homes. San Francisco’s trophy gun was originally displayed at the busy intersection of 8th Street and Market and Grove, directly in front of the looming, doomed old City Hall and its now-controversial Pioneer Monument. The San Francisco Call covered the dedication ceremony on March 22, 1900, and reported how General Shafter, hero of the Cuban campaign, personally presented the cannon to Mayor James Phelan as a memorial to the valor and patriotism of the U.S. Army. The Prince de Conde appears in innumerable photos of old City Hall and the Pioneer Monument taken both before and after the earthquake of 1906. The cannon somehow survived the fires that followed the earthquake and reduced the surrounding Civic Center and commercial districts to cinders. It apparently remained in front of the Pioneer Monument for years after the rubble of City Hall was cleared away until sometime, around 1920, the city decided to relocate it to the then-new De Young Memorial Museum in Golden Gate Park. There, paired with another 1898 trophy cannon, the Prince de Conde guarded the doorway to the west wing of museum, which appropriately enough displayed military trophies from the just-concluded Great War. It’s not recorded when the Prince de Conde and its mate were removed from the de Young but it was definitely before the 1950s—otherwise this Boomer-era kid would have remembered scrambling all over it. 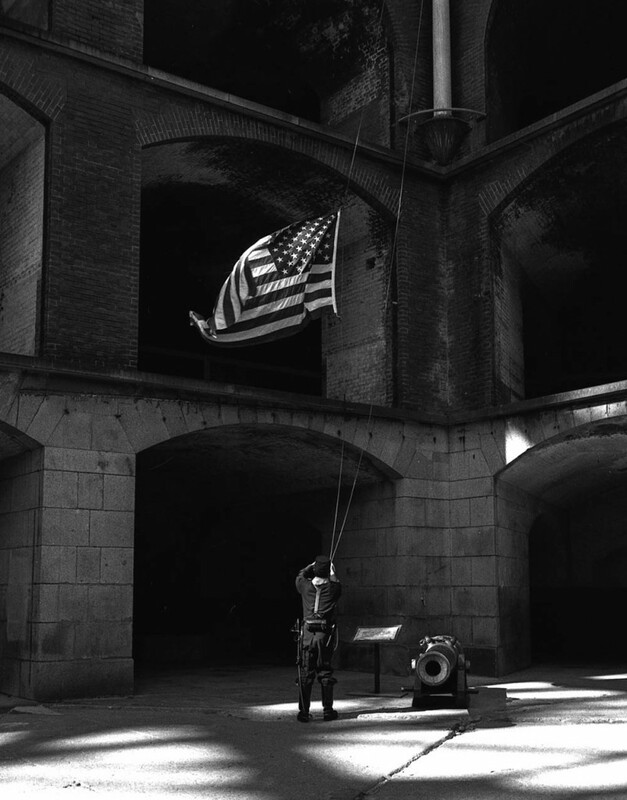 The gun likely went into storage for a couple of decades before re-emerging as a display piece at old Fort Point, where I photographed it in 1969 alongside a Civil War reenactor lowering the American flag. Fort Point and the Prince de Conde cannon in 1969. Photograph by John Martini. In July 1973, the cannon was relocated once again, this time to the front lawn of Presidio Bldg. #2 (originally built in 1864 as a hospital) near the post’s main parade ground. The Sixth Army was creating a military museum in Bldg. 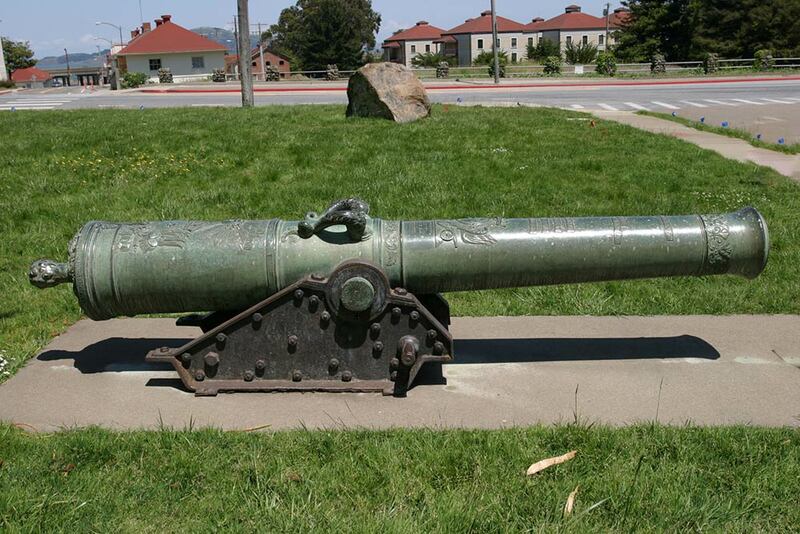 #2, and the Prince de Conde became part of an “ordnance park” of antique cannon displayed outside the Presidio Army Museum, which formally opened in March 1974. When Congress ordered the Presidio to close down by 1994, the Army’s Center for Military History reclaimed many of the museum’s artifacts and transported them back to Washington, D.C. However, the Prince de Conde and several other cannon were left behind since they were still the property of the City of San Francisco’s Fine Arts Museums. Although the Sixth Army and its museum are long gone, the Prince de Conde remains where it’s been for nearly 45 years—on the Presidio lawn at the corner of Funston Avenue and Lincoln Boulevard, its muzzle forever pointed protectively at the YMCA parking lot across the street.